This sketch requires a little more back story to make sense. Christopher Hitchens is of course one of the more public leaders of the new atheism movement. His brother Peter is a Christian. You can read an article about the two of them here. I wanted to illustrate a growing debate about genetics and belief in God. Because atheist believe that nature is all there is, they have to try to explain everything through biological or natural means. 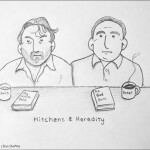 The book in front of Christopher Hitchens is The Selfish Gene written by Richard Dawkins. The book in front of Peter Hitchens is The God Gene. Unlike some of my other sketches, the book in front of Peter doesn’t represent what he believes. However, I did think the two books provided a funny contrast of the snarky atheist (Christopher) with The Selfish Gene and his much more cordial brother (Peter) with The God Gene. Both books are a part of a growing literature base seeking to explain actions and beliefs strictly from a genetic point of view. One large obstacle to those seeking to use genetics to explain belief/faith is that the leading geneticist in the nation, and former head of the Human Genome Project, is an outspoken Christian. While Dawkins and Dennett seek to meddle outside their field into genetics, Collins’ breakthrough research in DNA hasn’t convinced him of a “natural explanation of religious phenomenon.” So much for their interdisciplinary efforts. The book The God Gene is written by a respected geneticist (Dean Hamer), however, he has received significant criticism from scientific colleagues for lacking the necessary support for his over-reaching claims. He is considered to have “rushed” his ideas into a book without allowing his theories to be cross reviewed by other scientists. So much for their “expert” panel. The final element of this drawing that I wanted to communicate was to simply illustrate two brothers, from the same parents (gene pool), with very different beliefs. It seems that faith, or belief in God, seems to be something greater than mere heredity. Additionally, if evolution were true it would make sense that once a gene pool reached the apex of atheism that all future children would be equally evolved and therefore atheistic. However, there are numerous cases of believers whose parents were atheists. 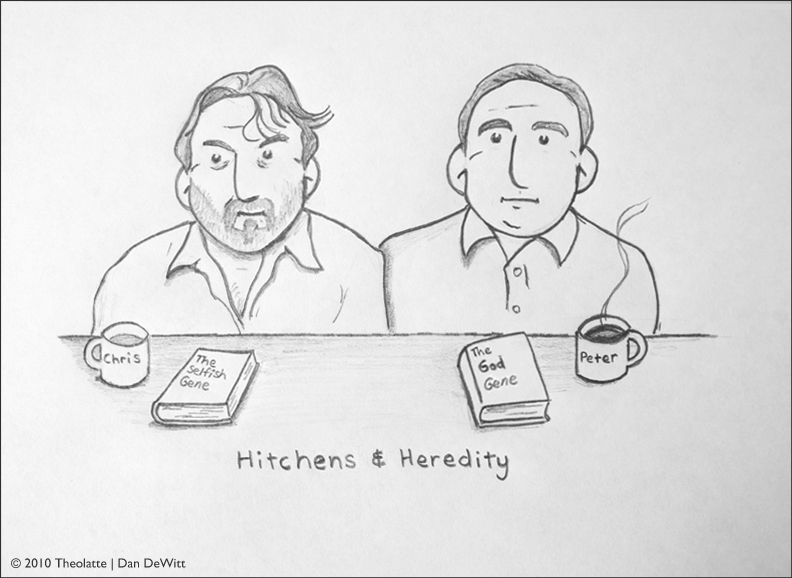 Hitchens & Heredity: It seems that there is more to belief than genetics.